Lysine is an amino acid not produced by the body but essential to the growth of protein molecules in the body. It is necessary for tissue repair and growth, and for producing antibodies, enzymes, and hormones. Lysine is found in other protein sources, such as red meats, chicken, and turkey. Most individuals have an adequate intake of lysine; however lysine levels may be low in vegetarians and low-fat dieters. Without enough lysine or any other of the eight essential amino acids, the body cannot build protein to sustain muscle tissue. The body only uses L-lysine to build protein. 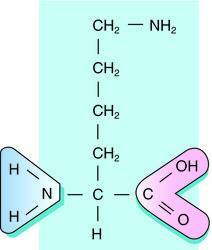 Since amino acid molecules are asymmetrical, each amino acid exists as both a right- and left-handed form, distinguished as “D” and “L” respectively. As a supplement L-lysine is used to treat the herpes simplex virus, help prevent osteoporosis and cataracts, and boost the immune system. In the 1950s, scientists discovered that foods containing certain amino acids could encourage or discourage the growth of the herpes virus. 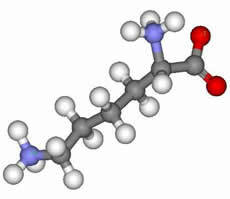 When added to the herpes virus, the amino acid arginine increases the growth of the virus. Lysine, on the other hand, suppresses it. Since the virus can cause cold sores, canker sores, and genital sores, L-lysine supplements increase the ratio of lysine to arginine in the body, curing the outbreak of the virus. Avoiding foods with arginine and eating foods with a higher lysine content will also help alleviate the symptoms of the virus. Lysine also promotes the body’s absorption of calcium, helping to prevent osteoporosis. It slows the damage to the eye caused by diabetes, and it may help cure atherosclerosis. Since it is used to slow the herpes simplex virus, its antiviral properties may help treat chronic fatigue syndrome, hepatitis, and HIV. L-lysine is best taken as a single supplement and not in combination with other amino acids. Such combinations are touted as nutritional supplements that build more muscle and are often used by athletes and body-builders. However, too much protein strains the functions of the liver and kidneys and can cause other health problems. The single supplement should be taken on an empty stomach because larger amounts of the amino acid can build up in the blood and brain, enhancing its health benefits. Supplements are best used by individuals suffering from a herpes outbreak or by vegetarians and low-fat dieters. Postmenopausal women can take lysine to encourage absorption of calcium by the body. Some consumers are sensitive or allergic to soybeans, a popular food used by vegetarians to replace the natural supply of lysine found in many meats. However in 2002, researchers announced progress in creating soybeans that could be tolerated by consumers with those sensitivities by shutting off a gene in soybean seeds believed responsible for causing the allergies.